Another Kind of Wildflower Fan . 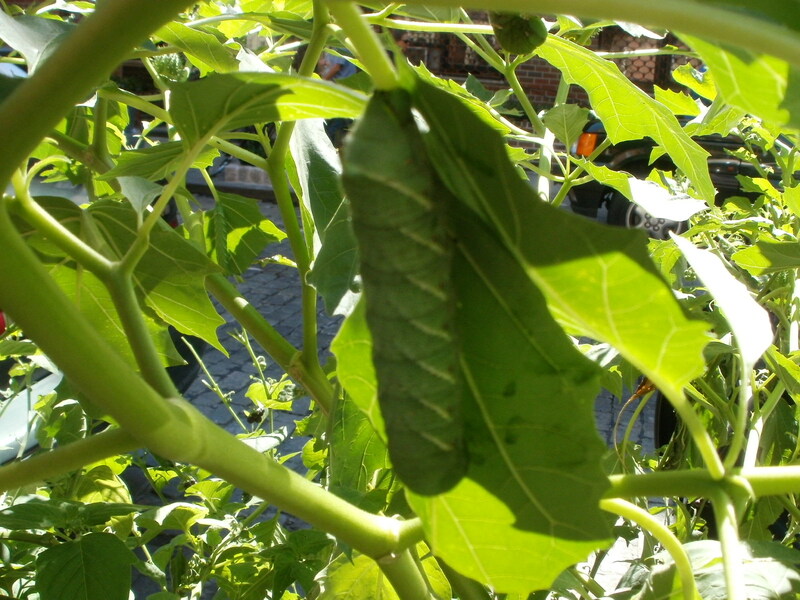 . .
My most recent post, which investigated the drab, yet delicious, Lambs Quarters, also introduced another New York City writer, Ava Chin; her “Urban Forager” blog investigates the wild and edible botanicals growing within the environment of the Five Boroughs. 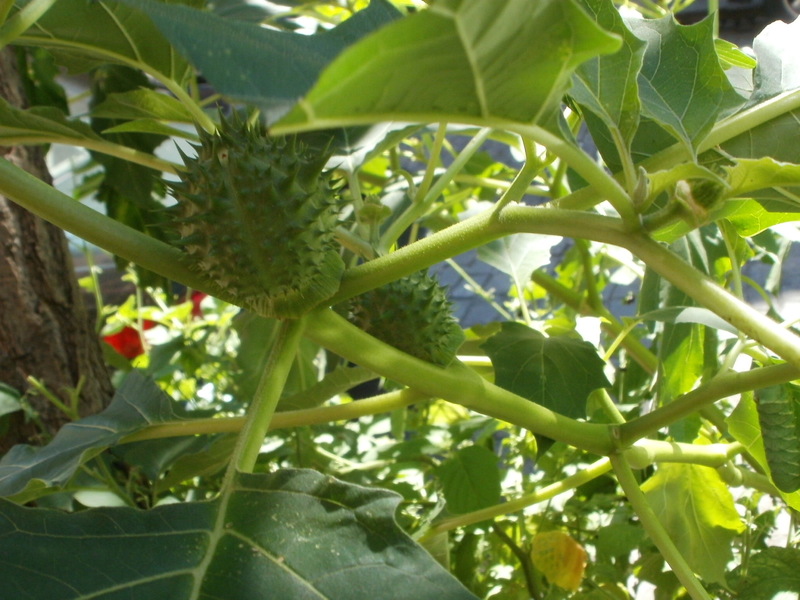 Chin’s most recent column, posted on August 21st, discusses Jimsonweed, also known as Devil’s Trumpet, Datura stramonium. Perhaps with that essay fresh in the rear of my mind, I found myself walking with my wife, Maryann, after we had finished a Sunday brunch at The Village Den restaurant on Greenwich Avenue. As we walked home along West 12th Street, we came upon a large stand of Jimsonweed, several plants that towered nearly five feet in height. The long, narrow, white trumpet flowers were unmistakable, despite being closed in the bright morning sun. The spiny seedpods, which resemble immature green horse chestnuts, were plainly visible, too, in loose clusters wherever one of the plant’s leafy branches joined the main stem. 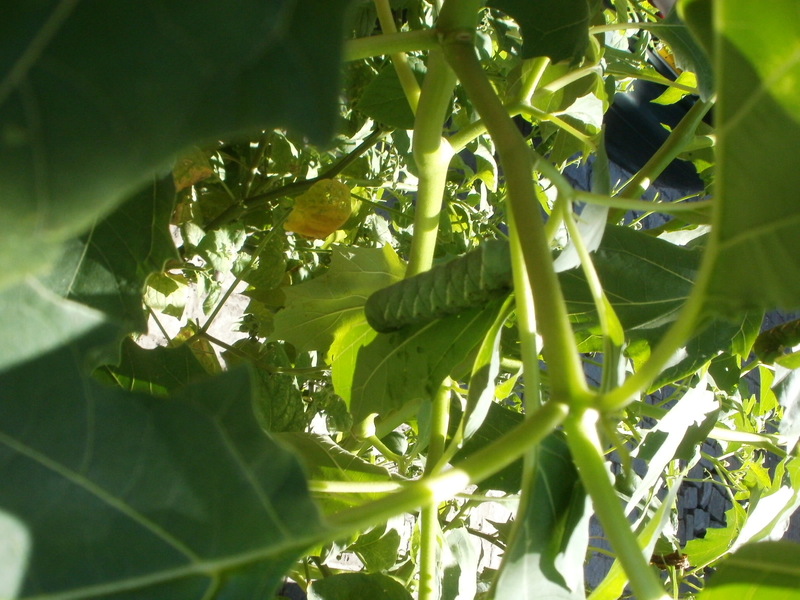 Maryann perceived an interesting shape among the leaves, and closer inspection brought us up close to an enormous green caterpillar. The creature was fully extended and measured as long as a middle finder and as thick as a thumb. 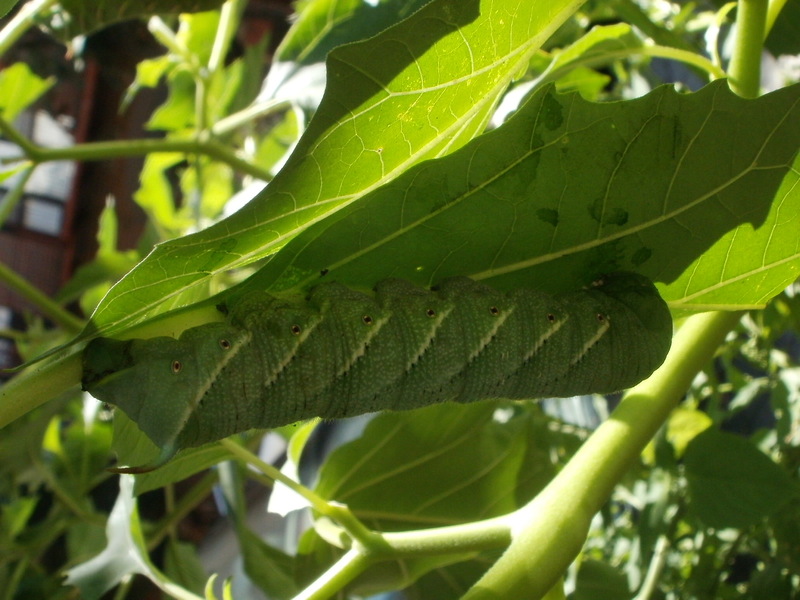 My search through online scientific databases has led me to conclude that this caterpillar was an example of Ceratomia undulosa, the larva of the large and elegantly-patterned Waved Sphinx Moth. And this moth-to-be was munching away. One of the photos we took clearly shows where it had been dining. Ava Chin made mention of the Jimsonweed’s hallucinogenic properties, which are profound enough to have been referenced in the books by the shamanistic author, Carlos Castaneda, so one can only wonder what kind of trip might reside in the near future of this future most magnificent moth! I think we have had Waved Sphinx Moths. 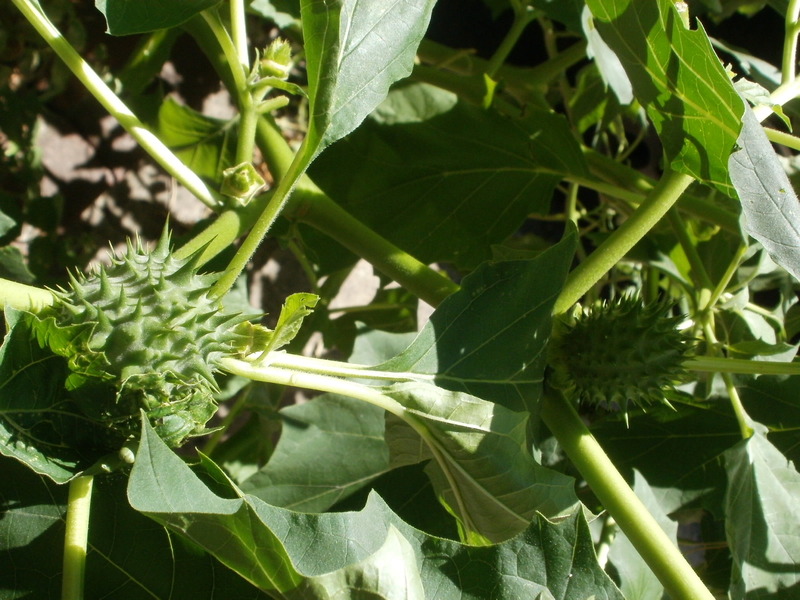 I know for sure, though, that we have Jimson Weed.